I butchered and froze the various parts of three chickens early last week and I’ve been thawing it out in phases for different recipes: stock from the bones for beans and soup; coconut “fried” chicken and grilled coconut curry chicken with the thighs; Buffalo sauce with Greek yogurt ranch on the wings from “Cook This, Not That”; and a Philly chicken “cheesesteak” with one of the breasts. I haven’t decided what to do with the legs yet, but I’m leaning toward rubbing them down in pesto and roasting them in the oven. We were going to do chicken tikka masala with rest of the thawed out breasts but Indian food is freakin’ complicated and I didn’t feel like measuring out 100 different spices. I was about to make more of that cheesesteak chicken when the craving for Sizzler’s Malibu chicken hit me simultaneously in belly and brain. I must have seen a Sizzler commercial during football and the propaganda worked. My brain did a quick scan: Chicken and ham, check. Panko, check. Mustard, mayo, honey; yup. I ran the chicken through the batter station and par-pan-fried it on each side. They roasted at 400 degrees for 10 minutes before I pulled it out of the oven. I covered it with the ham and slivers of muenster cheese. In general 2 oz. of deli meat is 50 to 60 calories and 1 oz. of cheese is 100 calories. I know I’ll spend 160 extra calories in the name of good taste, and you shouldn’t be afraid to either if you are eating lean all the time. I whipped up the sauce while the chicken cooked for another 5 minutes. 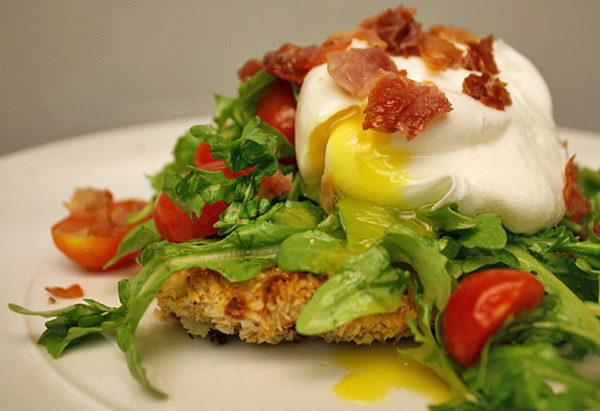 Equal amounts of yellow mustard and low-calorie olive oil mayo with a drizzle of honey. You’ll want about a tablespoon for each breast. That’s about 50 calories. When the chicken is done put it on a plate, spoon some of the sauce on it and sprinkle with a little parsley for some fresh zip. 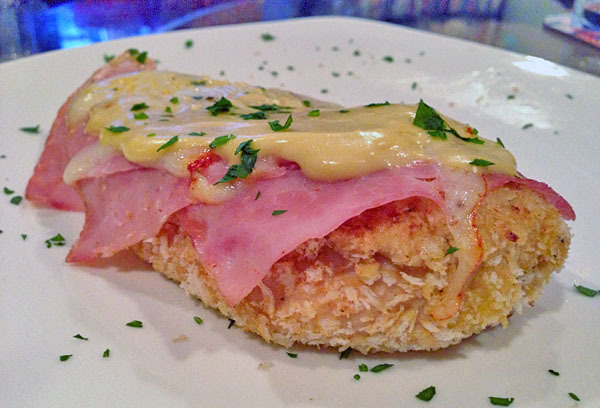 The simple sauce is greater than the sum of its parts and you can’t argue with tender chicken in a crunchy coating covered in salty ham and gooey cheese. I grew up eating at Sizzler. All you can eat shrimp as a kid, and later steak and Malibu chicken dinners with mom when I got older. I’ve since left the restaurant and its bountiful buffet behind, but with this recipe in my arsenal the loss of dinosaur-shaped chicken nuggets and garlic toast doesn’t sting as much. I’ve been trying to cook every meal at home since the new year began. I’ll delve deeper into that on Saturday when I post the first weigh-in of 2013, but, to get to the point, I’ve had all but three meals out (one breakfast and two lunches) in the last 10 days. It wasn’t a resolution necessarily, but a goal I’ve had for a long time. For some reason, this time, it’s finally starting to click. The idea for “coconut crusted chicken” popped into my head a couple of nights ago. 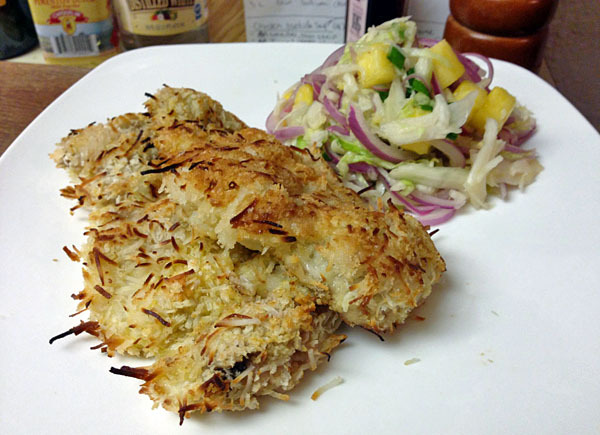 I found a link to “Coconut Crusted Chicken Tenders” from the Can You Stay For Dinner blog. I went looking for chicken and left with a whole new outlook on weight loss. The blog is written by Andie Mitchell, a 27-year-old who lost 135 lbs. by cooking and exercise. Her honesty is encouraging, and seeing that she lost so much weight without any gimmicks is inspiring. She writes about taking it one day at a time, one choice at a time, and that truly is the right mindset to make it happen. So, back to the chicken. I wasn’t so much looking for an exact recipe as I was just to see how someone else did it without messing it up. I planned to de-bone the chicken thighs I had cut down earlier in the week, but they were still slightly frozen by the time I arrived home. It was a pain to get the bones out and more then a few times I wanted to call it quits. 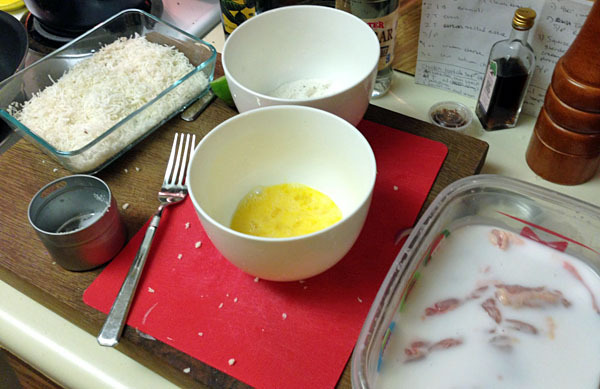 Drain the excess coconut milk from the chicken, drop it in flour, then in egg, and finally into the coconut/panko mix. Pan fry for 3 minutes per side and bake on 400 degrees for 10 minutes. I’m terrible with batters, especially using wet and dry hands. I’m always running back and forth from the sink. That, paired with the hunger of having to stop at the grocery store for a couple of ingredients, then waiting to marinate, AND THEN … AND THEN!!! … fighting with monster batter hands. I had enough. I slumped against the kitchen cabinets and slid all the way to the ground in protest. Nadia, who was napping before dinner, woke up, came to the kitchen and calmed me down. She said she’d help with the batter and we pushed through. The chicken was done and in the oven before I knew it. The slaw– 2 cups of shredded cabbage and 1/4 thin-sliced red onion soaked in lime juice with salt plus cubed pineapple and scallion–took about as much time to assemble as it did for the chicken to bake and then rest. We almost went out. Because I almost gave up. It wouldn’t have been worth it, and nothing could have been better that night than the coconut-crusted chicken WE worked together to make. There are going to be nights where I don’t want to cook, but, if I truly want to control what’s going into my body, I’m the one who has to take control. I’m the one behind this wheel. Now, on to the next one. I have this habit of trying to feed my co-workers little bites of whatever is on the menu that day just to see how other people like Chef Brian’s food. 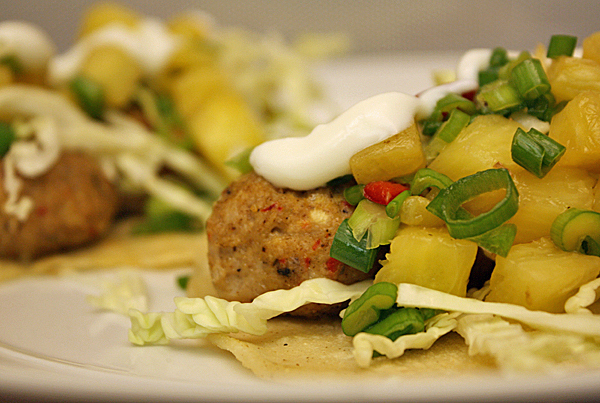 They’re usually stoked on whatever is cooking that day, but in the case of Week 19, Meal 3: Jerk chicken meatball taco with cabbage and pineapple salsa, my buddy Josh said he’d never had flavors like these before. Indeed, it’s not easy to find a place making legit jerk chicken in Orange County — and this was my first encounter with Jerk spice as well — but now that I’ve had a taste, I’m curious enough to seek out the real deal. I promised myself when we started this blog that I’d be open to new foods and be willing to revisit ingredients or dishes I’ve never had a taste for, or have flat out never liked. I can thank Chef Brian for my new found love of tomatoes and turmeric to name a few, but he’ll probably never get me to appreciate seared ahi tuna (I usually try Wifey Nadia’s seared fish before cooking my fillet all the way through). And another dish I’ve never really liked? Meatloaf. 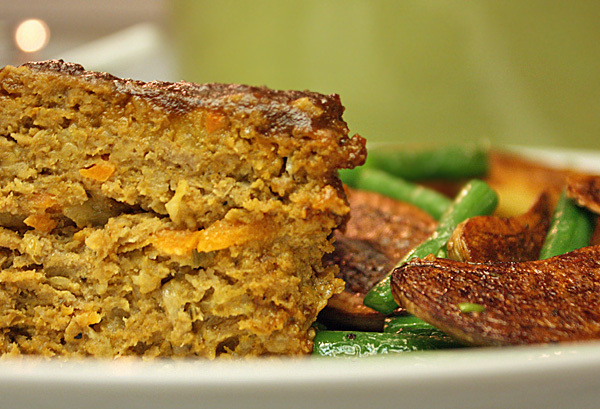 Of all three dishes on our American menu, Week 15, Meal 2: Turkey meatloaf with pan-roasted fingerling potatoes and green beans was the one I was least excited for.